Can you believe it?! 7 weeks of daily art have passed and we haven't missed a single day! Lots of weird objects painted and lots of glitter have been used. It's Valentine's day week and I thought I would do a heart, chocolate, kissy face, lovey dovey themed week. I've always had a love hate relationship with Valentine's day. I used to work as a florist and usually that week was complete hell. Rose thorns would give me kisses all day. The 14 hour work days standing on my feet and arguing with customers about the color 'peach' were definitely not something I would want to do again. Now that I've gotten a bit off track, let's get onto this week's art prompts! As always feel free to join in on this challenge and if you do decide to do so, let me know! Comment below or send me a message! I want to see what you create. I hope everyone has an ultra creative week! 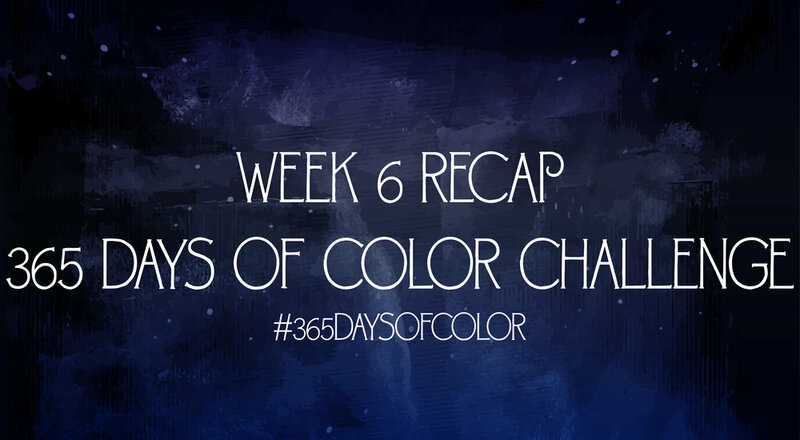 Welcome friends to the weekly recap of my 365 days of color challenge! Let's jump right in! Maybe eggs will look like this in the future...? Pink and mettalic purple peppers are always the hottest. I can only eat broccoli that is dipped in purple ranch dressing. What would this popcorn look like? Pretty sure I've seen bread like this in the store... truth is stranger than fiction? Probably the strange thing I've painted so far. This recap is a bit shorter because I've been struggling with a headache all day, but I'm determined to put out a recap EVERY Sunday! That's another reason why I am doing this challenge, to make sure I show up EVERY DAY to my goals. Showing up every day and doing the work helps me get better as an artist and also increases my productivity. Doing this daily challenge I've noticed I'm able to get way more done in a day than I used to. I will post this weeks prompts in a few hours, so stay tuned! This post may contain affiliate links for art supplies that I personally use and find very helpful. So you might too! Hello again friends! Another week has slipped through 2018 fingers and that also means another week filled with weird art! This week I felt like a hot pile of garbage for a few days, but I somehow managed to paint an object every day, even if I felt like someone was banging a brick against the side of my skull. Migraines are the worst. Migraines two days in a row should be illegal. Who do I talk to about this? ...or a totally non purple rose. Way to go Sherstin. The theme of this week was purple... stuff, but I guess I wasn't married to the idea that EVERYTHING had to be purple. Looking at this photo I realize that there are tiny threads hanging off the petals and I just want to reach inside the screen and cut them! Is rainbow lavender still techincally lavender because it's not lavender colored?! I realized after painting these that they basically lost their "lavender" qualities and now it looks like some mystical underwater Atlantis plant. Which I'm not mad about. This was for sure my favorite this week. Painting each flower took a long time, maybe a couple hours, but it was worth it in the end. It looks almost like a Van Gogh orchid plant...maybe, or maybe I'm seeing things. January 18th Prompt - Eggplant... No wait Peacock Feather... Ugh ok just a feather! I found it outside like this I swear! This was the day that my head felt like it was literally going to explode. I completely forgot that I wanted this day to be 'eggplant' day... working title... and switched it up with another day. Well no one told me that peacock feathers don't take paint very well. They kind of curl up into a little ball like a toddler that was just told Barney isn't a a real dinosaur. After a quick search I decided to say screw it and painted on this calligraphy pen. It actually does look really nice and I feel ultra fancy when I'm writing my fan letters to Jeff Bridges. The more colorful the veggie is the more nutrients right? Ok,, I never claimed that EVERY object I painted would be a masterpiece. That's why this is a challenge, I'm challenging myself to turn something as odd as an eggplant into something pleasant to look at. I mean come on have you seen how an eggplant really looks. It's kind of uncomfortable. On a side note, painting on the inside of an eggplant is really very satisfying. There should really be some ASMR videos out there about it. Glitter covers all sins right? I started painting this and had a grand vision of intricate wavy lines on the inside of the cabbage, but when I started painting I realized that this purple dude wasn't going to cooperate with me. So I worked with the cabbage and not against it, but covering every inch of it in glitter. Take that purple dude. That's this week! The trials and tribulations. The tears and triumphs. Every week I think I gain a bit more of an understanding about how paint adheres to different surfaces and what works and doesn't. I will be posting this week's prompts shortly, so stay tuned and if you want to participate in this challegne (even if it's just for a week) feel free! Use the hashtag #365daysofcolor and message me with your art. I will feature everyone who participates in my future posts. 365 Days of Color Challenge! Ahem... well I guess I'm a bit early to the party. Are you ready for 2018? Do you have any goals or resolutions you might want to accomplish? In 2017 I made a promise to myself to be as creative as humanly possible. I had a day job which I was extremely unhappy in and felt disappointed in myself that I wasn't creating art. I made excuses for myself, such as I was too tired, my job was too stressful and I didn't have enough resources to create art. In reality, I was just bullshitting myself. I had time, art de-stressed me and I had MORE than enough resources to create art. So here comes the new year and all these resolution things that people start and don't finish. I said to myself, "I'm going to be different." 2017 started and I wrote down in a planner that I would be a creative powerhouse. I marked on a calendar each day that I created something, even if it was just a few brush strokes on canvas. Each step was one step closer to creating a positive change in myself. By the time April and May came, creating art and going out and taking photos, was second nature. It was a part of my daily routine and I knew I couldn't go back to my old life. "Why the hell are you telling me this? ", is what you're probably thinking or yelling at your computer. Well that brings me to my 2018 resolution which is to not only create every day but also to push the limits with my art. A lot of art challenges involve drawing or painting certain objects everyday. Well as an abstract artist.. that is a bit more difficult. So why not paint ON these objects?! Yes that's right, I'll be painting an abstract painting on a steak at some point in 2018. The 365 days of color challenge will start on Jan 1st and I will select a random object each day to make an abstract painting on. Bananas, Shampoo bottles, tacos... yes a taco is one of the objects that I will be slapping with paint in 2018. Each week will have a theme related to each object and I will post at the beginning of the week what objects I intend to paint on so anyone that wants to join the fun can! Use the hashtag #365daysofcolor so I can see what everyone makes! Is this idea silly... maybe a bit bizarre? Well that's the point! Art is supposed to be enjoyed and be enjoyable to make! So have some fun with me! Let's party and make 2018 the most creative year yet. What's this a blog post?! Week 5 Prompts - 365 Days of color challenge! Week 4 Recap! Glitter Ice Cream and Blue Giraffes!